Otto's - "a booklover's paradise" since 1841! 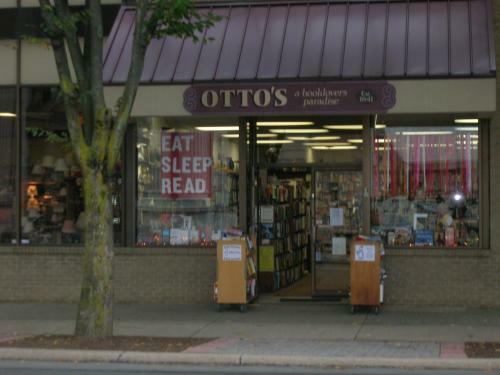 From 1958 through 2004, Otto’s Bookstore in downtown Williamsport had been including in its ads and on its stationery the phrase “since 1877.” So where did that date of origin come from? But various customers had brought old receipts and newspaper ads (one found under the linoleum they were removing from their kitchen) into the store and some of the dates were earlier than 1877. So when her son Peter found himself with some extra time on his hands after his company moved to Florida, Rider asked him to see what he could find out from the city directories in the Brown Library. He also scanned a number of archived daily papers for early stories or ads. What Peter found was a succession of splits and mergers that date back to the 1841establishment of A. D. Lundy and Co., at 24 East Third St., a business dedicated to the selling of window shades, wallpaper and books as well as insurance. In 1867, the same A. D. Lundy expanded to 26 and 28 East Third as he took in a partner, J. J. Ayers and called the business Ayers and Lundy, selling the same products. Four years later an Alexander Dean joined the business, focusing primarily on the sale of insurance. Two years later, in 1873, Alexander’s nephew, John M. Dean, joined in the bookselling side of the business. The following year, in 1874, he moved his bookselling across the Square to 12 W. 3rd. Ayers and Lundy continued to sell window shades, wallpaper, books and insurance and took on Hiester Otto in the insurance department. In 1893 when John Dean moved his business to 232 West 4th St., he took Hiester with him. In 1905 Jack Roesgen (Rider’s father) started working at 232 West 4th which was now called The Loan Bookshop and listed as its owners, in succession, Henry L. Otto and John B. Otto. In 1916, John B. Otto, who was also a junior rodman for the Pennsylvania Railroad, City Engineer, civil engineer and surveyor, moved the bookstore back to Market Square (16 West 3rd) and appointed Roesgen manager. Two years later Roesgen moved to Philadelphia to work at the George W. Jacobs Bookstore. Six years after that, he returned to manage the H. Y. Otto Bookstore at 16 W. 3rd. (Its ads no longer mentioned window shades.) In 1928 Otto’s got its first phone number—5764—the same number it has today, with the prefix, 326. When Jack Roesgen died in 1958, his wife, Margaret, and daughter, Betsy, kept the business going. Three years after putting a new face on the storefront, they lost their lease and moved to 25 West 4th (a smaller store that didn’t have room for wallpaper). In 1971, Margaret retired and Betsy’s husband, John Rider, left his job as librarian for the Lewisburg Federal Prison to manage “the store.” Shortly after expanding to 29 West 4th, they lost their lease again and moved to their present location at 107 West 4th. In 1997 John retired and Betsy and two of her sons, Bill and Tom, tried to fill his shoes.